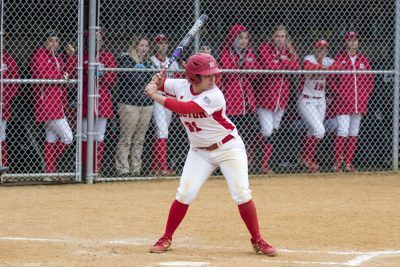 A disappointing 1-4 result at the Louisville Slugger Tournament left the Boston University softball team with an 8-12 record on the year with just over two weeks before Patriot League play begins against the United States Military Academy on March 31. However, BU head coach Ashley Waters and her team will have some rest this week before they begin the St. John’s Invitational Saturday morning against the University of Massachusetts Amherst in Queens, New York. At the Louisville Slugger Tournament, the Terriers suffered a 5-3 10-inning loss to San Jose State University before dropping another close one to then-No. 21 California State University, Long Beach in eight innings. BU’s lone victory of the tournament came against San Diego State University, where the Terriers racked up five runs in the first four frames for a 5-2 win. 6-0 and 10-2 losses to California State University, Fullerton and No. 3 University of California, Los Angeles, respectively, turned what was a promising first three games into two harrowing defeats for BU. The Terriers have already competed in four tournaments, including the most recent Louisville tournament, and were swept by Loyola Marymount University while they were in Southern California over spring break. BU has lost six of its last seven contests, but Waters said she is hoping the upcoming tournament will provide an extra spark for her team following perhaps its worst tournament. Those Northeast foes will include UMass, Binghamton University, St. John’s University — who is hosting the tournament — and Hofstra University. UMass comes into this tournament with a 9-8 record on the year, St. John’s sits at 5-16, Binghamton at 3-6 and Hofstra at 10-7. UMass and Binghamton split their most recent tournaments while St. John’s saw the same 1-4 result as BU at the Colorado State Tournament. While Hofstra ultimately went 2-3 at the Unconquered Invitational hosted by then-No. 13 Florida State University, the team did not go down without a fight. The Pride edged Florida State (18-6) 1-0 after freshman infielder and outfielder Jessie Joy scored the lone run of the matchup during the 10th inning. Hofstra then fell to the No. 6 University of Oregon 2-1 in an 11-inning outing, which was followed by a 5-0 loss to Florida State and a close 3-2 loss against Florida Gulf Coast University. Last year’s St. John’s invitational — featuring Manhattan College, Stony Brook University, Fairleigh Dickinson University and Hofstra — was cancelled due to a winter storm. It looks like this year’s invitational will not succumb to the same fate, as this upcoming weekend’s forecast calls for sun all weekend. This tournament will be the third in the span of three weeks for BU. As last weekend’s tournament may have indicated, these runs can take a toll on the players. However, Waters said she expects her team to be ready for anything the Terriers’ tightly packed schedule may throw at them. Following this weekend’s tournament, BU will play two-game sets against Bryant University in Rhode Island and host the University of Maine in Boston. A game against Manhattan (7-5) on March 25 and a Wednesday afternoon tilt against Boston College on March 28 will finish out the Terriers’ non-conference slate before they begin conference play, with Army (4-12) and Lehigh University among their first opponents. “The kids will be ready to go this weekend and it’s just a matter of continuing to get better and progressing to do what we need to do to win games,” Waters said.